We realise that coming to Ardroy, or sending your child is a new experience, and that you will naturally have concerns and queries. On this page we hope to answer some of the questions we frequently get asked. If you can't find the answer here, please email us using the contact details at the foot of this page. It is best not to phone, as we may not be able to give you an answer straight away. There is always an inherent amount of risk in what we do. We always make our activities as safe as humanly possible, all instructors only deliver activities they are qualified in, and we are regularly inspected by AALS, the industry watchdog. We work within nationally approved ratios of students to instructor. Will I be forced to do something against my will? We believe in challenge by choice. We never force anyone to do anything - you can always say no. We can be very persuasive though! Bring lots of old, warm clothes and lots of socks. We supply full waterproofs, wellies (not boots), fleece, and rucksack as well as all other specialist gear. Please bring your own warm hat and gloves and a water bottle - a small reusable plastic bottle is ideal. Please mark your clothing so it can be identified and not end up in lost property! Download a clothing list here. We do get 'fun' weather at Ardroy. We aim to do everything despite the weather. If it makes an activity too hazardous, we don't do it. We often alter the programme to suit the weather. Aim to try everything, even if you're not sure about it. A few plastic bags are good for keeping your dirty clothes separate from your clean clothes (if any!) on the way home. There are no banks in Lochgoilhead, or petrol, or diesel (and mobile phone reception is pretty limited)! Will there be more than one group in the centre at the same time? Yes, there may be. However we have three separate accommodation units, and each group uses one or more unit each. 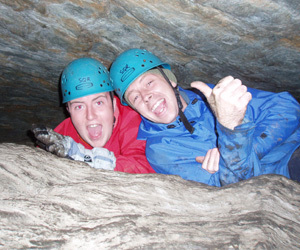 You would have a separate programme, and almost invariably work with the same instructor throughout your stay. However, you will probably eat with the other group, or groups, as we have limited space in the dining room. Mixed! - it does rain a lot in Lochgoilhead, but we get very pleasant spells as well. The weather is never the same for more than a few days. It doesn't snow much in the winter, and we are very rarely cut off by the snow (once in the last three years). Traffic Scotland have a webcam at the Rest and be Thankful (about 6 miles from Ardroy, and 246 metres above sea level). See what it is like right now by clicking as follows.